Regular inspection helps keep your forklift in good working condition. 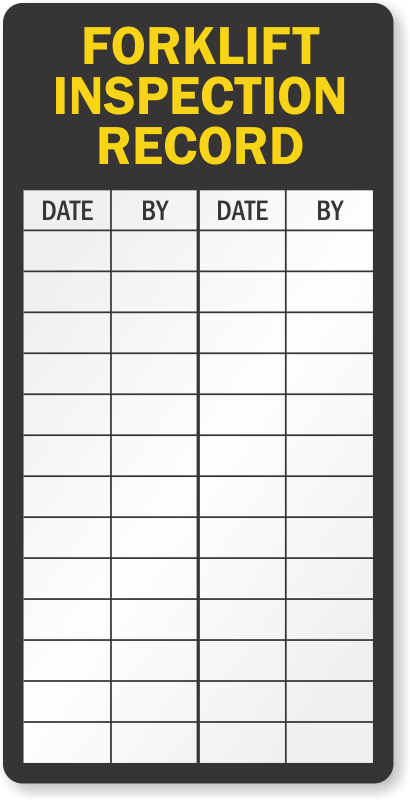 A handy Forklift Inspection Label makes sure that you have a record of the inspection checks. • Label helps keep a record of each periodic inspection of your forklift to avoid mishaps. • To apply, just peel off the liner from the label and apply to any clean surface. Annealed aluminum can be engraved or debossed. Readable impression, even if ink washes off. Write with a pencil or ballpoint pen. 3M adhesive for metal or smooth plastic surfaces.